This is the final book in the Lisen of Solsta series, and what a finale! Once again, Lisen and Korin are separated, duty coming before their personal relationship, as they endeavour to prevent Garla and Thristas going to war. Sixteen years previously, a young, naive eighteen year old Lisen fought her first battle in these lands and she now prepares for another, though she hopes she can prevent it from ever happening. The lives and fortunes of the main characters over the past sixteen years are recalled, tying up loose ends for the reader, while the story moves on to its ending. There’s suspense right from the beginning, though I have to confess to skipping a little in my eagerness to reach the climax of the story of the House of Ilazer. The final chapters resonate with magic, power and courage. No spoilers, but a memorable and visually dramatic conclusion is a fitting finale for this enjoyable series. From a Californian beach, Lisen Holt is transported to a different world, one she knows but does not yet remember. 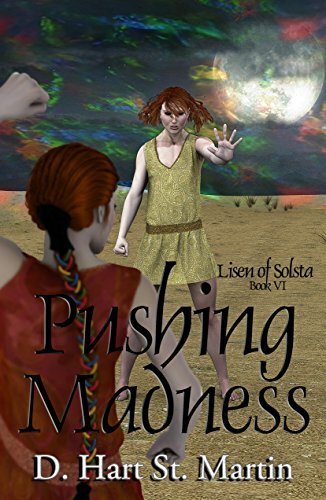 In the haven of Solsta, with the help of Hermit Eloise, the facts of her birth and childhood are drizzled into her consciousness. 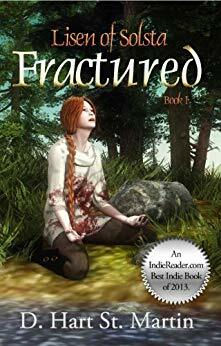 Her Destiny is laid before her, requiring her acceptance and this is the underlying theme running through Fractured. This is the beginning of Lisen’s journey from carefree Californian teenager, living with Mom and Dad to talented hermit and necropath and the heir to the throne of Garla. I really enjoyed this book! Once into her writing, St Martin writes a great story. In a very short time I cared about Lisen and was interested to see how the story would unfold. With the story beginning from Lisen’s point of view, I was caught out and had to back track a couple of times when the point of view changed, but it didn’t detract from my enjoyment and read easily from then on. I loved the characters of Ariel and Lorain and can’t wait to find out how their relationship progresses! There are instances when the same story is told twice from two different points of view which, for my taste, was not necessary and one would have sufficed. I started to skim a bit where Lisen visited the same thoughts, as I was eager for the story to continue so maybe there was a little too much repetition of similar ideas. This book is about a real young women, faced with a real situation. I felt for her as she battled with weapons training on the journey to Halorin and loved Jozan for supporting her. Her reticence using gifts she has not thoroughly explored is genuine as is her determination to help others, not considering the cost to herself. The final scenes of the book are testament to the mental and physical pressures she has been under as she attempts to come to terms with a new, strange life. I have no hesitation awarding 4* and look forward to reading the next book in the series.